This is a concise overview of Chatteris Weather since power conservation measures in mid December 2016, hovering over each of the images and clicking, will either take you to the manual or information on the item. Expanded information on the original stations set-up can be found HERE,however, the information below is the most current. The LINKS page fully lists all the software used on this Personal Weather Station. Chatteris Weather uses a high specification Davis Vantage Pro 2 wired weather station, various sensors are connected to the Integrated Sensor Suite, this in turn is connected to the main display console. Data is exported continuously from the display console by a data logger which uses a USB to connect to the Meteobridge Pro. The Meteobridge Pro replaced a PC which was running 24/7 in order to keep Weather Display software live and updating to the internet, the Weather Stations hourly power consumption has now dropped from 250 Watts to just 2 Watts. The IP Hikvision webcam is powered over the ethernet cable via a power insertion unit, Meteobridge Pro is configured to view the images generated by the webcam, every 5 minutes, the Meteobridge Pro updates my stations image on Weather Underground. The Meteobridge Pro is also configured to send scheduled data to a wide range of weather site as well as Tweet weather conditions every half hour. 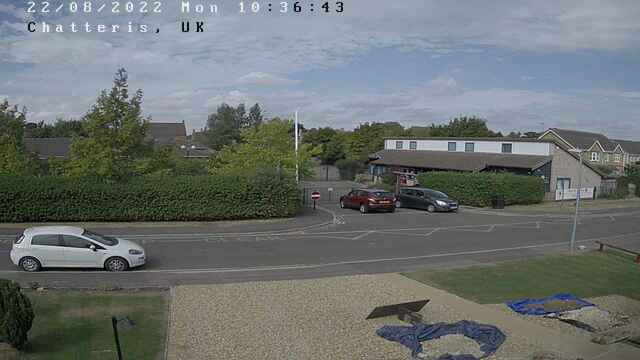 Chatteris Weather uses the Saratoga Template, the displayed Hikvision webcam images is linked back from Weather Underground. The weather station is powered via an uninterrupted power supply (UPS) as is for all weather related equipment, this will run the station independently in the event of a power outage for approximately 2 Hours before turning off. Meteobridge Pro is cabled to a Netgear switch which is connected to a Huawei HG633 router, I use Fibre to the Cabinet, giving a download speed of 55Mbps and upload speed of 18Mbps. Chatteris Weathers internet service provider is TalkTalk and data is hosted by GoDaddy.